View More In Cat 6 Cables - Page 7. RJ45 Pass Through Cat 6+ Connector simplifies twisted pair terminations by allowing the wires to be inserted through the connector and out the front.This allows the technician to easily verify the proper wiring order.The electrical performance of the termination is optimized by pulling the connector down over the cable jacket and seating it tightly in the rear of the connector. This reduces the distance between the wire twists and contacts . When terminating your Pass Through connectors, twist all your extended conductors together into one tight bundle and then insert into your Pass Through crimp tool to be terminated. 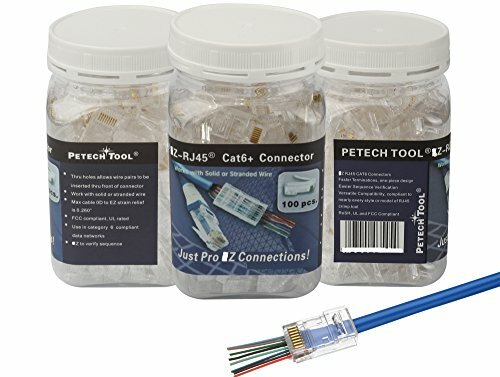 PETECHTOOL RJ45 Pass Through Connectors are fully RoSH, UL and FCC compliant . Because they reduce the distance between wire twists and contacts, electrical performance is enhanced. Note that the maximum cable length of Cat-6 ethernet cable should be 328 feet or 100 meters. PETECHTOOL Gold Plated Pass Through RJ45 Pass Through Plugs let you quickly and easily create category 6 cables in your preferred lengths. Our clear 1-piece Pass Through connector design makes wire sequence verification a breeze, speeding up terminations and reducing scraps and waste. Time is money, and PETECHTOOL Cat6 Connectors save you both. Tools designed for installing these connectors are the recommended PETECHTOOL Pass Through -RJ45 Crimp Tool, sold separately. The clamshell connector's simple one piece design with no bars or liners works with solid or stranded wire. With category 6 performance per EIA/TIA B.2. 90 Day Money Back Guarantee for your peace of mind. In the unlikely event that our products do not perform to your expectations return them for a full refund of your purchase price. Faster Terminations One-Piece modular plug, inserting wire pairs is quick, easy and efficient thanks to the front insertion, one-piece design. Easier Sequence Verification The transparent body makes identifying the wire sequence easier and helps to reduce scrap and wasted crimps, RJ45 crimp connectors are ideal for all Cat 3, 5, 5e, 6 compliant data networks. Reliable, compliant performance of RJ45 8P8C CAT6 - End Pass Through Ethernet RJ45 one-Piece High Performance modular plug (Cat5 100Pcs) connectors work effectively. Cat-5/6 heads/plugs connectors 8 pins network cable modular plug. Electrical performance of the termination is optimized by pulling the connector down over the cable jacket and seating it tightly in the rear of the connector Reduces the distance between the wire twists and contacts improves performance For use in Cat 6 compliant data networks. 90 DAY MONEY BACK GUARANTEE ensures your satisfaction. If you have any questions about this product by PETECHTOOL, contact us by completing and submitting the form below. If you are looking for a specif part number, please include it with your message.